A Wigan dad-to-be who was left deaf in one ear following an unprovoked attack by a stranger, will finally see justice done to the man who nearly destroyed his life. Mark Collier, 29, attended Bolton Crown Court yesterday to see his attacker, 21-year-old Dominic McPherson, plead guilty to grievous bodily harm and assault on another man. The former self-employed landscaper from Golborne had been enjoying the England and Tunisia World Cup game in Ashton with his friend Adam Buckley in June last year, when the pair were set upon. After receiving a blow to the head, Mark fell unconscious and did not come round until the next morning in Salford Royal Hospital’s intensive care unit. 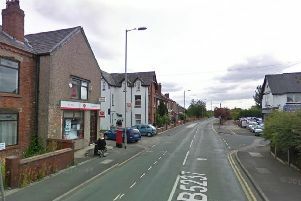 Adam was also hit in the assault, which took place outside a taxi rank on Wigan Road. It has taken around eight months for McPherson to be brought before a judge. In that time, Mark has visited medical specialists for his persistent deafness, as well as his ongoing dizziness and vertigo. He has been forced to give up his business because he has been unable to drive or operate machinery. During yesterday’s hearing Judge Richard Gioserano decided to adjourn the sentencing in favour of receiving medical evidence from the Crown Prosecution Service, which will detail the extent of Mark’s injuries. Speaking to McPherson, he said: “You are a young man of previous good character that will be taken into account when sentence is passed. “This assault upon Mark Collier leaving him with ongoing psychological and physical difficulties, you should understand - being a serious offence with aggravating features; you face a very real risk of an immediate custodial sentence. Mark, who is expecting a child with fiancee Hayley Melling, said that the attack almost ruined his life - but that he will come back stronger than before. “I really just want to see it over and done with now,” he said after the plea hearing. “I have lost the hearing in my right ear and I have suffered from vertigo ever since. “He has lost me my job and I have lost thousands of pound as a result. “But if you knock me down, I will come back 10 times stronger. His best friend, Adam, who was assaulted, said that attacks should carry heavier sentences. Adam was plagued with anxiety following the attack, during which he thought McPherson had killed his friend. Adam said: “He punched Mark so hard that he flew backwards in the air several feet and was already out cold before hitting the ground. McPherson will return for sentencing on March 6.